So my fiance and I will be getting married this coming January, and the excitement building up to the big day is killing us! We’ve planned everything out, reserved our cake, food, venue, music, etc. but we are still figuring the way we want the layout and decor to look in the venue. I did joke about having some Harry Potter themed items in our wedding but that was a no go. Lol. But, that didn’t stop me from still looking some things up on Google and Pinterest out of curiosity. Below are some of the highlights I believe I came across, from the wedding cake design, to the ring design some people have used for their big day. Enjoy! Above are a few of the creative ways some couples sent out their invites. A Marauder’s Map as a wedding invite? So awesome! Above are some of my favorite wedding favor ideas. The handmade wands at every table setting is such a nice idea. The Floo Powder can be anything you can put in a jar basically. Ground Coffee, cocoa powder, etc. And just in general any Harry Potter themed candy is a great idea for your guests. Maybe even a chocolate frog! A Wizarding World wedding wouldn’t be complete without the right decor. Ideas I’ve come across that just make the wedding are floating candles, house colors for the guests tables, and quotes that every Potterhead would know. You can’t have a wedding without food, and Harry Potter themed treats are a plenty. Above are photos of some of the best treats I would love at my wedding. Pumpkin Juice, treacle tart, and of course Butterbeer! You can also Google some awesome themed cocktails that will surely add a kick to the adult wizard. You can always incorporate the Harry Potter theme with the ring box if you are’t into designing your ring in the style. But I have to admit I’ve come across some pretty prefect rings that are jaw-dropping. I hope you enjoyed this style of post! Do you know of anyone who’d had a Harry Potter themed wedding? Are you planning on incorporating anything into your own wedding in the future or have you in the past? Let me know! I’d love to hear them! Over 10 years, that’s how long filming for the Harry Potter films took to complete. A decent amount of time for there to be some interesting film facts if you ask me! Below I included some of my favorite facts as I began a Potter Marathon again this past weekend. As a Potterhead you might know some of these but my hope is you come across something new! Enjoy! Is it really much of a surprise to know that the owners of “Weasleys’ Wizard Wheezes” were born on such a date? Remember potions class? Hermoine sure does. The third smell Hermione recognizes in the Amortentia potion is Ron’s hair. It was 1990 when Harry Potter author J. K. Rowling, was on a crowded train from Manchester to London when the idea for Harry suddenly “fell into her head”. So happy to know that she moved forward and changed the lives of so many! 4. THE PRINCE OF POP AS HARRY POTTER? It’s said that Micheal Jackson once approached JK Rowling in hopes of making a musical/play. She politely declined, but no worries, she ended up writing many screenplays and we now have Harry Potter and The Cursed Child on Broadway! The play first opened in the United Kingdom. 5. GELLERT GRINDELWALD WAS IN THE “DEATHLY HALLOWS” FILM? Yes, for anyone who maybe hasn’t realized it yet the bald old man Voldemort speaks to in Azkaban is the dark wizard Grindelwald. He asks Grindelwald where the Elder wand is to which Grindelwald replies, “Surely you know I no longer have what you seek.” The film then jumps to a much younger Grindelwald apparently stealing the Elder Wand and jumping out an open window. The old man then lets Voldemort know the location of the Elder Wand — it was buried with one of its former owners, Dumbledore. This is then the point where Voldemort kills Grindelwald. It was not too long ago my fiance sat and watched the Harry Potter films with me for the first time. FIRST TIME! But anyways. Lol. At the end of the films I had realized that she did not know the character was played by two entirely different actors. For the first two films actor Richard Harris played the part of the Headmaster of Hogwarts. Unfortunately, Harris was diagnosed with Hodgkin’s disease in August 2002, reportedly after being hospitalised with pneumonia. He died at University College Hospital in Fitzrovia, London on 25 October 2002, aged 72. The actor who took his place was Michael Gambon, who played the part so well apparently even some couldn’t tell the difference. Well not really. For his audition tape Rupert decided he would rap! And of course tell why he believed he should get the part of Ronald Bilius Weasley. But the rapping I’m sure is what won the hearts of those casting. 8. COULD YOU IMAGINE HERMOINE NOT PLAYED BY EMMA? It was at her school in Oxfordshire that Emma Watson auditioned for the role of Hermoine Granger. She say’s they just came around asking if anyone would like to try out. She admits she never got her hopes up as even her father let her know she was up against thousands of other girls, but she stuck to it and she became the heroine we all came to love. 9. YOU CAN REALLY VISIT DIAGON ALLEY AND HOGSMEADE! Sort of. I’m actually quite surprised that so many don’t know that there are theme parks like Universal Orlando or Universal Hollywood that allow you to partake in the Wizarding World! If you’ve never been to either of these places and you’re a Potterhead you must put them on your bucket list. Having visited both there are a few differences, but if I had to recommend visiting just one, it would be the Orlando, Florida location as it is much larger and offers some more options for you to experience. Check. It. Out! Must visit Harry Potter theme parks and tours. Hey! I hope you’ve been having a great start of the week so far! I’d like to take a moment to write about some must visit Harry Potter theme parks and tours. It still shocks me when I speak to people who say that they’ve never visited ANY type of theme parks. And even more when I speak to someone who is a Potterhead but has never visited a HP event of any kind! There are certainly some experiences that I believe are a must at least once that fill you with the magic of the Wizarding World. I made a short list of these places and events below. Something to keep in mind is if you’re looking for something Harry Potter related going on near you, a simple Google search works wonders. The Wizarding World of Harry Potter: Orlando, FL. So this one most people already know about, but for those who aren’t familiar, these HP attractions I’m about to mention lie within Universal Orlando’s two Orlando theme parks. Universal Studios and Islands of Adventure are a 2 minute walk from each other, but both have different elements of Harry Potter. If you’ve ever wanted to know what escaping Gringott’s Bank while being chased down by Voldemort feels like, this is where you can have that experience. 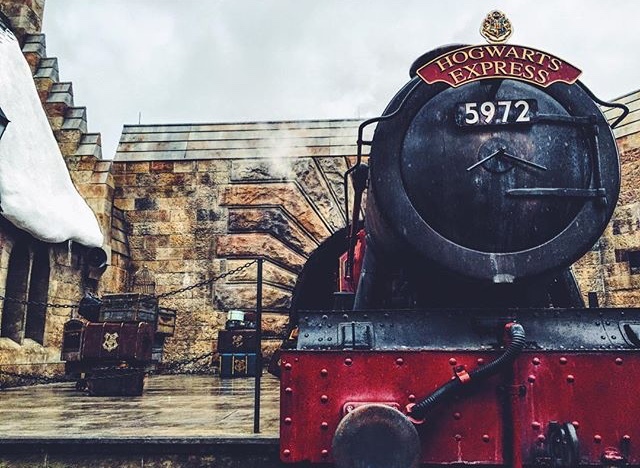 Want to ride Hogwarts Express? Well they have something for you too. From purchasing a wand to tasting a Butterbeer or Chocolate Frog, this place immerses you into the Wizarding World like no other place. There are interactive locations where you can test your wand skills, talk to the Knight Bus conductor, or even see a Ukranian Ironbelly Dragon breathe fire! I want to literally go into every detail this place has but it would be a never-ending post, so if you’re interested in finding out more info click this link and explore! The Wizarding World in Hollywood, California is similar to the parks in Orlando, but there are differences that set it apart. If you’re in Southern California take a trip to this magical place inside Universal Studios Hollywood. The WB Studio Tour in London doesn’t have thrill rides like the two previous locations mentioned, but this tour I believe takes you deeper into the story. This tour will show you real props from the films and show you some of the actual filming locations. If you’ve ever wanted to walk into the Great Hall or see 4 Privet Drive in person here’s your chance. What about taking a stroll through the Forbidden Forest, dropping your name into the Goblet of Fire, or entering Dumbledore’s office? This place has you covered! They do offer Butterbeer and other Wizarding World food that the theme parks offer. An amazing experience that you have to do at least once! Important tip: these tickets must be purchased in advance. Ever wanted to really ride the train from the HP films? Well it exists! The Jacobite is the real life train that was used to film all those amazing scenes, like when Ron and Harry were flying the Ford Anglia to escape the train over the bridge. This train runs through Scotland so another location in Europe, but a must if you ever have an opportunity. Tickets for this one go fast so don’t miss out! I hope you enjoyed this post! There are a few other places that I believe should be mentioned but I’ll save those for another post! If you have any questions on events or places to visit, or need information about them, please ask away and I’ll let you know everything I can to make your travels easier! So, if you haven’t gone to my about me section yet, you’re missing out! But also there’s a photo of my Harry Potter themed tattoo! Below I’ve attached some more images. If you click on any of them they’ll get larger so you can see them in better detail. I’m practically covered in tattoos but left a large section of my arm for this piece because I wanted it to showcase some of the items, people, places, etc. that made the stories special to me. I got this tattoo idea from somewhere I can’t remember but made changes that fit my personal style and what I wanted it to represent. Click a photo and check them out! The bottom near my wrist is really where this tattoo begins. The open book is a representation of the story coming off of the pages for me. And I added the words “Until the very end,” to express how important I feel the bond of sticking together in the stories was for everyone. The colors that are emerging from the book represent the four houses: red for Gryffindor, yellow for Hufflepuff, blue for Ravenclaw, and green for Slytherin. The first object you see in the tattoo are Luna’s Spectraspecs. Above you’ll see the Nimbus 2000 and a golden snitch. To the left slightly under the castle you have Harry’s glasses and his scar. A little further to the left I have the Deathly Hallows inked in with the Elder Wand as the centerpiece if you look closely. In the last image you’re able to see that the tattoo wraps around my arm a bit, even going through some of my previous tattoo work. But here you can slightly see Hedwig, a Hogwarts letter, a stag Patronus with a banner beneath is stating “I solemnly swear that I am up to no good,” and footprints from the Marauders Map wrap around my arm. You can’t see it in these images but I also have 9 and 3/4 near the castle ledge. The last detail to highlight are the three stars that sit right above Hogwarts castle. If you aren’t familiar with these, it’s okay! I know some people have never picked up the books and are huge fans of the films. But these three stars sit on every page corner of the Harry Potter books. These photos were taken only 4 hours after getting the tattoo so it might look real fresh in color and crispness, but the tattoo for me hasn’t lost any of it’s brilliance over a year later. You’ll see more of the piece in other photos I post in the future, but I hope you enjoyed reading about it! If you have any Harry Potter related tattoos let me know what they are in the comments section! I’d love to hear what sort of artwork other Potterheads have! Hope you’re all having an awesome day!